Nintendo's newest racer is almost here, and we have a checklist of things we hope to experience. 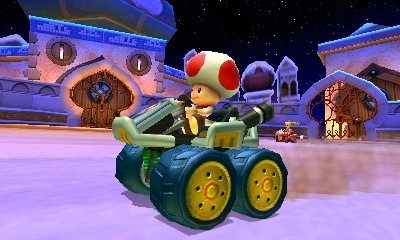 As Mario Kart 7's December 4 release approaches, we can't help but drool with anticipation. It's been six long years since the previous handheld entry in the franchise, Mario Kart DS, appeared, so you can't fault us for wanting this new edition ASAP. With this in mind, Mario Kart 7 comes fully loaded with a variety of cool stuff, from the tried and true formula of nailing opponents with turtle shells to hopping online and competing against others from around the world. We normally go with a first person view in most racers because doing so increases that all important sensation of speed. 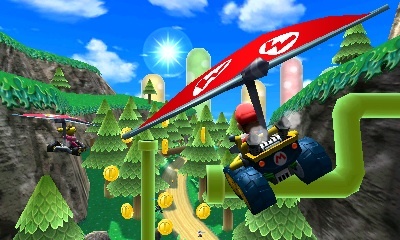 That said, Mario Kart 7's new perspective, combined with its 60 frames per second performance and gyroscope controls, should make for an interesting (we hope thrilling) experience. 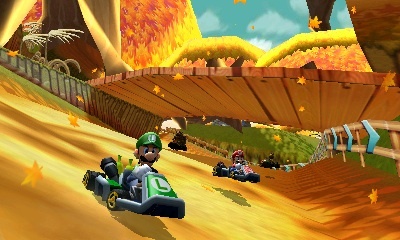 Nintendo did outstanding work implementing 3D effects into Super Mario 3D Land, and we expect this same level of quality in Mario Kart 7. Definitely interested in experiencing this first hand to see how it provides a newfound sense of depth to each race. 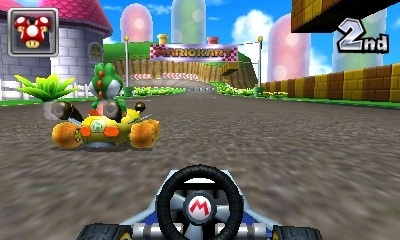 Almost every Mario Kart lets players catch some air. This one, though, grants them the gift of flight via hang gliders, letting players hover above the clouds while collecting gold coins. Now you can swap out wheels and body kits before hitting the track. Supposedly, the former affects grip, while the latter affects overall weight. We hope to have the sweetest kart out there. 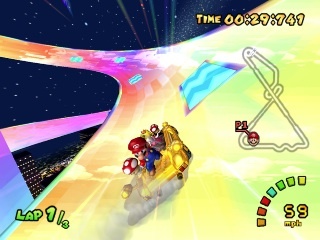 Each Mario Kart features a multi-colored track set in outer space called Rainbow Road, and Mario Kart 7 is no exception. Previous iterations feature huge jumps, loops and other surprises, so we can't wait to see what Nintendo has in store for this iconic location. Check out our Rainbow Road tribute. 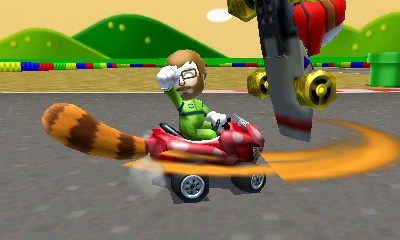 One of the newest power-ups, the Tanooki Tail, introduces melee combat to Mario Kart, as players putter alongside the competition and knock them off the track. In other words, make way, because we're coming through.